Grasslands are environments in which grasses and grasslike plants dominate the vegetation. Grasslands once covered up to 25 to 40 percent of the earth's land surface, but many of these grasslands have been plowed for crop production. Prior to the European settlement of North America, the largest grasslands in the United States stretched across the Great Plains from the Rocky Mountains and deserts of the southwestern states to the Mississippi River. Other extensive grasslands are, or were, found in Europe, South America, Asia, and Africa. Grasslands can be categorized as temperate or tropical. Temperate grasslands have cold winters and warm to hot summers and often have deep, fertile soils. In North America, other names for temperate grasslands include prairies and steppes. Tallgrass prairies in the Midwestern United States receive the most rainfall (75 to 90 centimeters [29.5 to 35 inches]) and are the most productive grasslands with grasses growing to 3 meters (almost 10 feet) in height. Historically, these were most abundant in Iowa, Illinois, Minnesota, and Kansas. 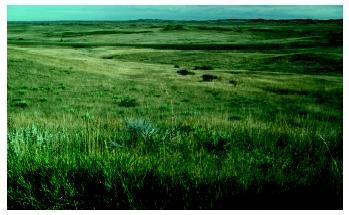 A Montana grassland. Temperate grasslands—also known as prairies—have cold winters and warm to hot summers. The driest grasslands (25 to 35 centimeters [9.8 to 13.7 inches] of rainfall) are termed shortgrass prairie, or steppe, with grasses seldom taller than 25 centimeters. These grasslands are found in Texas, Colorado, Wyoming, and New Mexico. Temperate grasslands are also called steppes in most of Europe and Asia, veld in Africa, and the pampas in South America. Tropical grasslands are warm throughout the year but have pronounced wet and dry seasons with annual rainfall amounts of 50 to 130 centimeters (19.6 to 51 inches). Most tropical grasslands have a greater density of woody shrubs and trees than temperate grasslands. Other names for tropical grasslands include velds in Africa, and the compos and llanos in South America. Grass-dominated ecosystems that contain a significant number of widely spaced trees are termed savannas . Trees may cover 5 to 30 percent of savanna landscapes, but grasses form a continuous ground cover. Africa, Australia, and South America have extensive savannas. Fire, drought, and herds of large grazing animals are common features in most grasslands, and most plant and animal life is well adapted to these forces. Fires are most common in grasslands with high levels of plant productivity. Fires are important for keeping trees from encroaching into grasslands—many tree species are killed by fire because their active growing parts are aboveground. Grassland plants survive and even thrive after fire because their buds are below the ground and protected from lethal temperatures. Typically, grassland animals are not harmed by fire. Those animals living below the ground are well protected, and most grassland birds and mammals are mobile enough to avoid direct contact with fire. Years of extreme drought are more common in grassland than in forested areas, and such droughts may kill even mature trees. But grasses and other grassland plants have extensive root systems that help them survive drought periods. The most conspicuous animals in grasslands are large grazers such as bison and antelope in North America and zebras, gazelles, and wildebeest in Africa. Grasshoppers also can be important consumers of plants, but nematodes (roundworms) and root-feeding invertebrates below the ground are actually the most significant consumers of plant biomass in many grasslands. Archibold, O. W. Ecology of World Vegetation. New York: Chapman and Hall, 1995. Cole, Monica M. The Savannas: Biogeography and Geobotany. New York: Academic Press, 1986. Lauenroth, W. K., I. C. Burke, and M. P. Gutmann. "The Structure and Function of Ecosystems in the Central North American Grassland Region." Great Plains Research 9 (1999): 223–259.